He Didn't Do It [Diddy] : Blog Of The Nation Bad sources implicate Diddy. Wrongly. 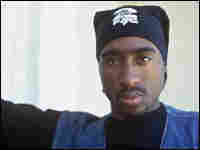 In 1994, rapper Tupac Shakur was attacked in New York City, in the lobby of Quad Recording Studios. Two years later, he was shot dead in Las Vegas. Neither case has been solved. David Folkenflik, NPR's media correspondent -- and the ringleader of Talk of The Nation's "Media Circus" -- will join us in the first hour, to talk about the Times story. If you have a question for him, leave it here.